Willing to work in Germany? Well, you need to apply for Germany EU Blue Card. Germany is top-notch destination in Europe for immigrants. The country offers excellent career opportunities for the overseas nationals to migrate and work in Germany. People who have working in Germany are experiencing high standard of living, high quality accommodation, social benefits, strong economy and many more. In a bid to allurer overseas skilled nationals to Germany, EU Blue Card was introduced on 1 August 2012. EU Blue Card for Germany is a temporary resident visa designed for non-EU nationals for the purpose of employment who possess academic qualifications and minimum wages. In order to apply for Germany EU Blue Card, applicants should have a valid job offer and employment contract. This card provides work permit for non EU nationals. People from various countries especially from India migrate to Germany for the purpose of employment. EU Blue Card for Indians enables overseas nationals to work and reside in Germany for a period up to 4 years or lesser period based on the job contracts. Germany EU Blue Card proposal was introduced by the European Commission as a one-track procedure for non-EU nationals to apply for a work permit for Europe from India or other nations. Individuals after deciding to work in Germany the first question that buzzes in their mind is how to apply for a European Union Blue Card? 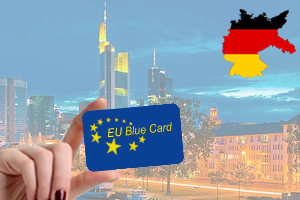 Here, we are providing some of the requirements for Germany EU Blue Card. Applicants need to fulfill the following Germany EU Blue Card requirements in order to lodge a Germany blue card application. Applicants should have a university degree and valid job offer and contract in Germany. Skill shortage occupations such as engineers, IT professionals, and doctors must receive a minimum yearly gross salary of €35,000. Germany EU Blue Card holders can be eligible for an unrestricted Germany work and residence permit after the completion of continuous three years stay in Germany, provided they should hold a valid work agreement while lodging the Germany PR application. Germany EU Blue Card acts as a Europe work permit for Indians and other country nationals. The following are the some of the Germany EU Blue Card features. Blue Card-holders with a knowledge spoken or written German can be eligible to apply for limitless work and residence permits after the completion continuous stay for two years in the country. Eligible spouses can be entitled to apply for work permit regardless of German language skills. Eu Blue Card For Germany, Germany EU Blue Card EU Blue Card for Germany, Europe work permit for Indians, Germany EU Blue Card, Germany EU Blue Card features, Germany EU Blue Card Requirements. permalink. My dream of moving and settling abroad in Germany has only been possible now. Thanks to Opulentus for it. Opulentus is the best visa services that I have ever worked with. They took care of my entire visa processing and also helped me a lot with the visa interview. Thanks a lot. Thanks for building confidence in me by offering best services with upmost care. Big thanks to each and every member of the opulentus team. Thank you Opulentus for providing me the details of Germany student visa, formerly.